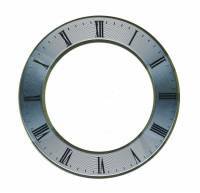 Description: 9-3/8” time track. 5-7/8” inside diameter. Brushed silver finish with black screened graphics. “Western Germany” designation at bottom of time ring. Regularly $14.00/each. While supplies last. 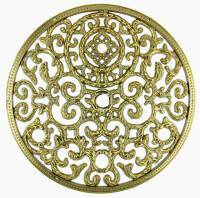 Description: 2-5/8” diameter x .014” thick aluminum with spun brass finish on one side, bright silver finish on the other. 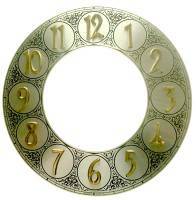 Use on dials, pendulums, case decorations, craft projects etc. Special buy. Normally $.50/each. While supplies last. Description: Plated aluminum. 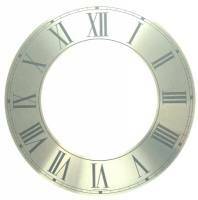 Black Roman numerals. 5" OD (127mm) x 3-3/8" ID (85mm). China. Description: Plated aluminum. 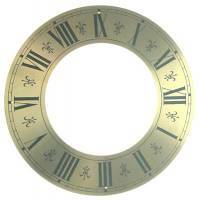 Black Roman numerals. 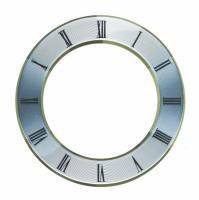 Silver background with brass tone outer & inner rings. No minute markers. 5" OD (127mm) x 3-3/8" ID (85mm). China. Description: Plated aluminum. Black Roman numerals. 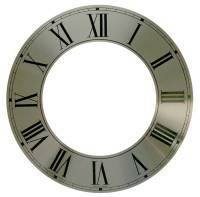 Silver background with brass tone outer & inner rings. With minute markers. 5" OD (127mm) x 3-3/8" ID (85mm). China. Description: 5" dial mask. Brass finished cast pot metal. China. 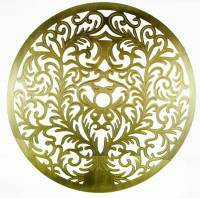 Description: Beautifully etched 5-1/2" diameter brass finished aluminum dial mask. China. Description: 5-3/4" dial mask. 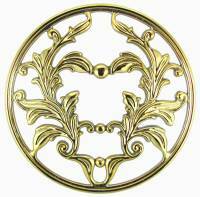 Brass finished aluminum. China. 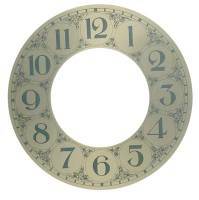 Description: 5-3/4" dial mask. Brass finished cast pot metal. China. 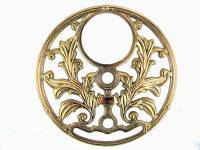 Description: 5-5/8" dial mask. 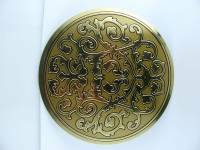 Brass finished cast pot metal. China. Description: Wood Screws. 4 pcs. each of #0, #1, #2, #3, and #4 sizes. 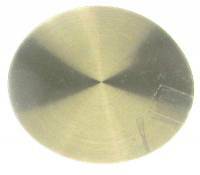 All are 1/4" or 3/8" long slotted brass round heads & flat heads. In a labeled partitioned box. Description: Machine Screws. 4 pcs. each of #0, #1, #2, #3 & #4 sizes. All are 3/8" long slotted stainless steel fillister heads. In a labeled partitioned box. Description: Chelsea Part #1378, dial foot (Grasshopper). Secures dial plate to movement. 3 per pack. Description: Cuts and scores paper, cardboard, light wood, plastic, etc. Cuts precise circles up to 5.9 diameter (15cm). With 6 blades. Extra blades sold separately. Extra blade not available. Made in Japan. 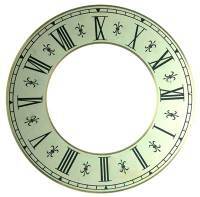 Description: For tall case clocks. Steel. 32.0mm long x 7.0mm barrel diameter. Barrel length is 24.5mm. 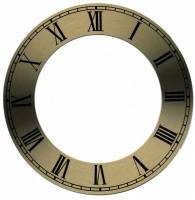 Description: 1" long metal dial retaining clip. 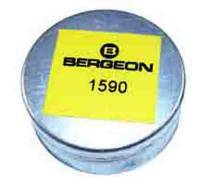 Description: 16 gr. container of white enamel dial paste. Mix with water and heat to a paste consistency, then apply. From Bergeon in Switzerland. Description: Place over winding arbors to properly locate movement. 5.5mm Id x 1-1/8" long. Plastic. Description: Adjustable steel dial cutter cuts perfect circles from 2" to 16". 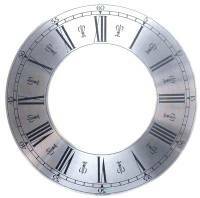 Ideal for paper & aluminum dials. Description: Four blades to a package. Used on old style dial cutter. Will not work on current style Part #13477.